When Bill Stauffer stepped into the role of Music Director three years ago, his heartfelt passion and artistic energy made an immediate impact on the chorus. 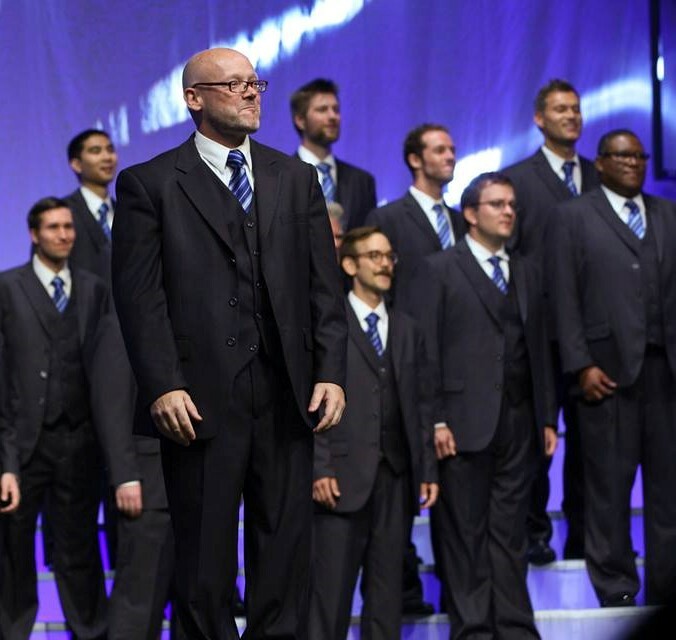 In his first official contest appearance with Voices of Gotham at the 2015 Barbershop Harmony Society (BHS) chorus contest, Bill directed the chorus in one of our most memorable contest sets, which earned its highest placement (6th!) and score to date. In many ways, Bill's leadership provided a missing ingredient that fostered growth and took us to the next level. This first contest was only a glimpse at what Voices would achieve in the coming years with what was to become an even stronger partnership. Following our founding Director Larry Bomback was certainly no easy task, but Bill struck a perfect balance in embracing old traditions and forging new standards. He pushed our members to new heights as both performers and as contributors to a larger community and organization. Including our 6th place finish at the 2015 contest, Bill directed the chorus to three consecutive top-ten finishes at the BHS international contest with a steady increase in score year over year. Bill also grew the chorus’s performance output by helping to establish our successful Harmony Happy Hour series, directing three self-produced shows with our partner chorus Sirens of Gotham, and participating in the "Lock and Ring" program, an educational concert and lecture series showcasing the history and influence of barbershop music. It is with the deepest pride and appreciation for Bill’s valuable work that we enter a new chapter for Voices of Gotham. Within the last few weeks, Bill has been presented with a new career opportunity that he has decided to accept. The expanded role will require additional time and focus that would take away from the passion, energy, and dedication he feels the chorus deserves. As a result, Bill has decided to step down as Director of Voices of Gotham at the end of this year. As a performing ensemble, we're disappointed to lose someone who has been so critical to the success of the past three years. As a brotherhood, we are proud to see Bill pursue this next step in his personal journey. Bill often mentioned that the Gotham family is one of support, empowerment, and inspiration; we are filled with joy as our members embark on new and exciting adventures. While the parting glass will soon be raised, we are grateful to have Bill lead us through our final concert of the year: A Night in Gotham on Saturday, December 9th. Voices of Gotham will soon begin conducting a search for a new music director. Further details will be distributed later this year, but interested candidates may contact directorsearch@voicesofgotham.org. We wish Bill the absolute best in this exciting new chapter of his life and cherish the time we shared together. It calls to mind the lyrics of the ballad with which Bill made his debut with Voices of Gotham: “For though I’ve gone, a part of me will always stay.” Bill, you will always be a special part of Voices of Gotham that we will hold dear for years to come.